During the End Times he destroyed the entire world, finally succeeding in carrying out Chaos' plans. 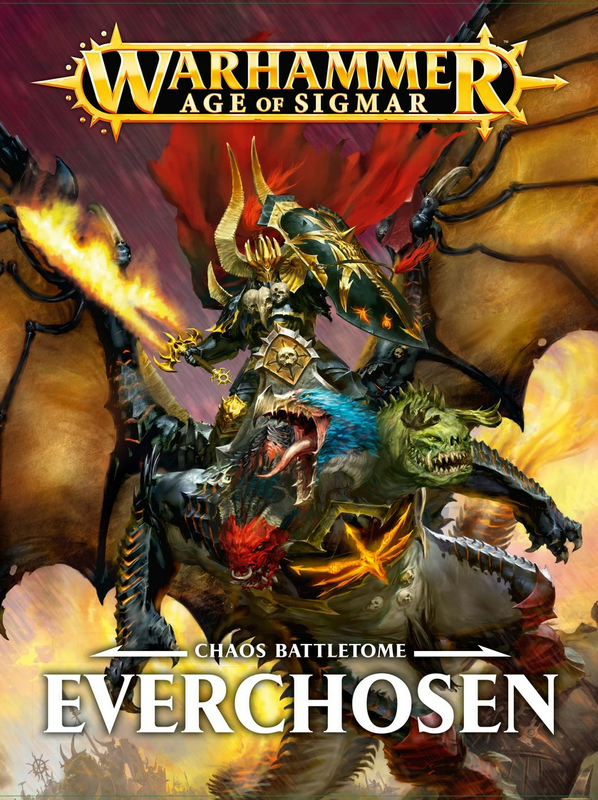 Now Archaon has returned as the Grand Marshall of the Apocalypse to the Mortal Realms, intent on conquering yet another plain of existence, and this time he has a fancy new book to help him, the Everchosen Battletome. This is a rather unique battletome in a number of ways. The most obvious thing that stands out is the cover. The standard version of it comes with a fancy full color dust jacket with equally cool art printed on the actual cover beneath as well. I'm not sure why this was done, maybe to justify the $58 price tag a bit more, but whatever the reason, it's a welcome addition. I'll admit, I'm a bit of a book collector and I love it when my collections look nice and pretty on my shelf. 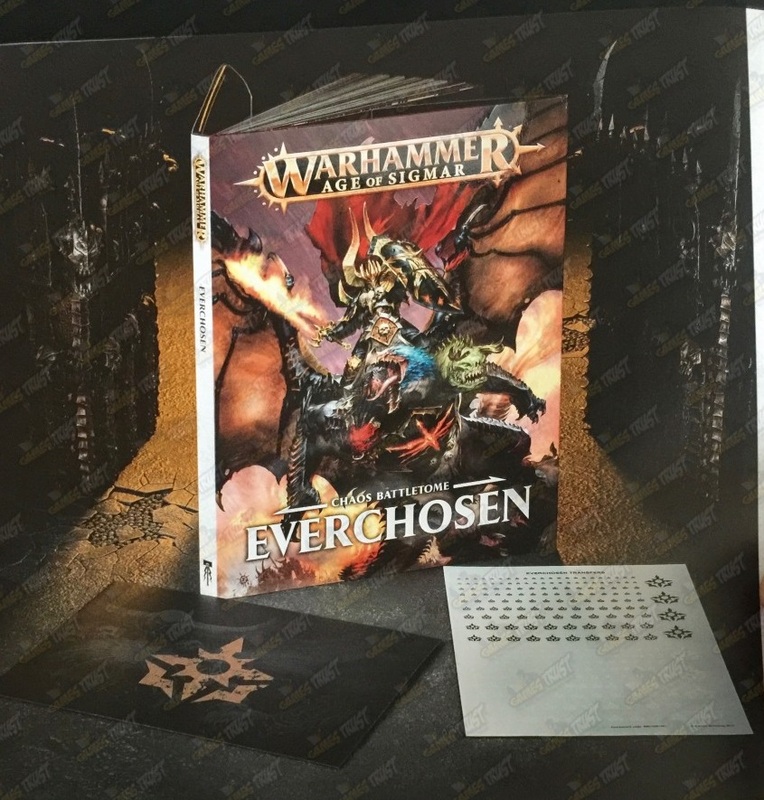 The next thing that is unique to this book is the inclusion of a sheet of transfers for an Everchosen army. This is again a slightly odd addition, but it's pretty cool. The new Everchosen logo/symbol is really well designed in my opinion. It plays off the classic Chaos star design, but looks a little more modern. 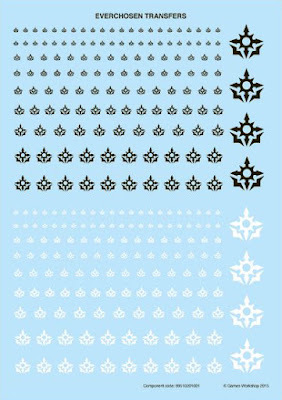 On the transfer sheet you get a bunch of different sizes of this symbol in both black and white. For anyone wanting to start an army of followers for Archaon this would be a great way of tying them all together into a cohesive force. It also comes in a pretty swanky black envelope with more cool designs printed on it. This sheet doesn't really add much to the book in general, but it's a nice little extra thrown in. The only complaint I have heard is what do you do if you use all of the transfers and need more? They don't sell this on it's own online, so you'll be stuck with browsing through eBay or relying on friends who don't need theirs. Once you crack open the actual cover you are presented with the absolute coolest opening to any GW book I have seen. 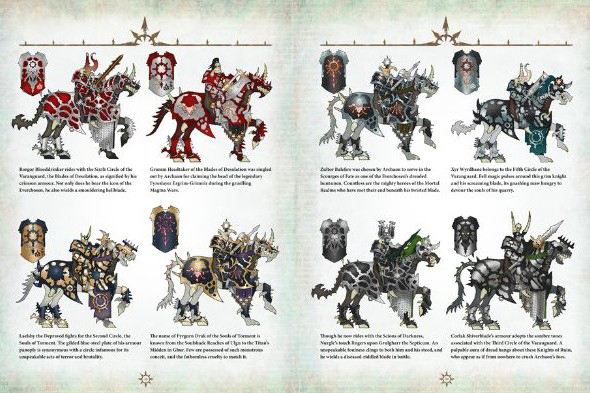 There are a handful of pages that tell the story of what Archaon has been up since the End Times, but in a super stylized and graphically entertaining way. 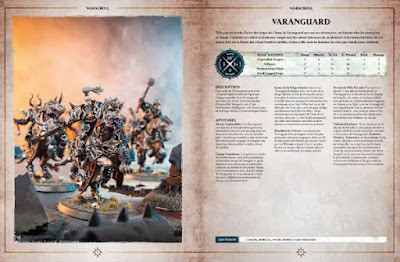 It's a very brief overview to be honest, but it's more to bridge the gap in the story and to get you hyped up for the rest of the battletome. This is some of the coolest artwork I have seen from GW. It's predominantly black, white, and red and reminds me of a comic book, but in a good way. I think of it as the little bit of opening action in a movie that get's you hyped for what's to come before the title sequence. Think the opening segment to The Fellowship of the Ring and you'll get the idea. 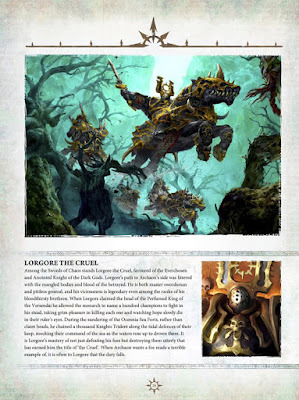 I can almost hear the dramatic music swelling which culminates with a drawing of Archaon in all his dark majesty, striding forward with his hand outstretched to grasp Ghal Maraz which sits on the ground before him. Very ominous. Then you turn the page and get the title page for the battletome. This whole part was superbly done, and suits the new narrative style GW is aiming for. Each of these battletomes is more a progression of the ongoing story then solely a resource book with a ton of history like what we were used to from 8th edition. Now we are finally into the battletome proper and you get the typical backstory for the faction. The Everchosen factions really only contains Archaon, the Gaunt Summoners, and the Varanguard, so that's pretty much all we learn about. 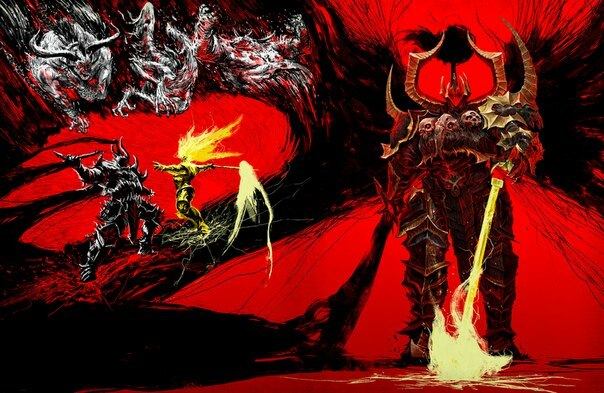 Archaon himself has been busy since the destruction of the Old World, having survived it thanks to his dark patronage. Since then he has been leading hosts of destruction across multiple realms and worlds, heralding their destruction. It seems like the Old World was just the beginning and now he has a real taste for ending worlds. You have to remember that thousands of years have passed, and living within the Realm of Chaos the rules of time apply to you even less. He is for all intents and purposes, pretty much a demon prince now, but still in a "mortal" body. I mean, he is probably about 10 feet tall. His steed has also undergone a change, and Dohgar is now a giant three headed manticore like beast. He was always a shapeshifting demon, and just took the form of a horse in the Old World. He has the heads of a Khorne, Nurgle, and Tzeentch demon because those were the champions sent to slay Archaon. Dohgar ate them once Archaon had defeated them, and absorbed a part of their being. There is no Slaanesh head because Slaanesh was missing and couldn't send a greater demon on his behalf, not because they are getting rid of him. Archaon has Slaanesh symbols on his shield and on Dohgar's armor. The Chaos gods both love Archaon for his effectiveness and fear and hate him for his power. They are afraid that he may usurp or destroy them someday. See, he's not the biggest fan of Chaos. Archaon is more of a nihilist and just hates everything, but especially Sigmar. He just sees Chaos as a means to an end, the most effective tool at his disposal. After they failed to kill him, the gods decided to send him into the Mortal Realms instead at the head of a giant horde. This led to the Age of Chaos, as the Chaos forces ran rampant across the realms. Sigmar was forced to retreat into Azyr and the rest of the pantheon of Order went into hiding, except for Nagash. 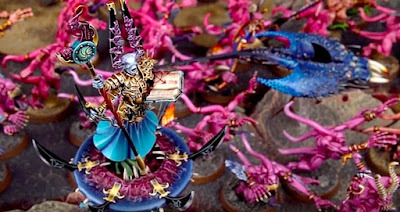 Nagash faced Archaon in combat and had his bony tail handed to him, effectively "killed", but really his essence was just sent back to the underworld to recuperate enough until he could re-emerge. 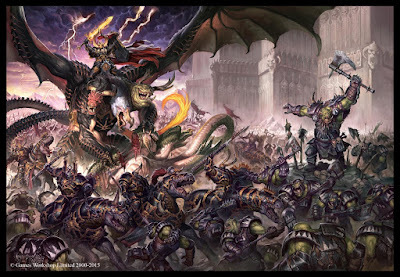 With his conquest pretty much secured, Archaon built his fortress, the Varanspire, within a pocket of the Realm of Chaos directly connected to the Allpoints. He never spends anytime there though, and has never even sat in his throne. Instead he is always out in the Realms, leading new conquests. 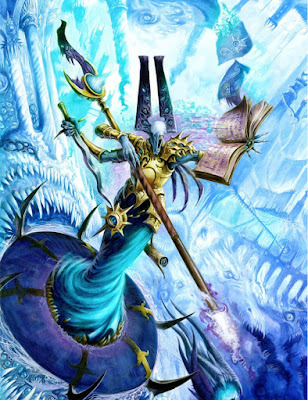 The Gaunt Summoners are powerful sorcerers of Tzeentch that he bound to his will. They serve him, but resent him at the same time. It will be interesting to see what happens with them as the story progresses. The Varanguard are his elite knights. They are chosen from the best of the best and must swear allegiance to Archaon alone. We get to read a bit about them and their organization. There are a lot of them apparently, organized into different levels. 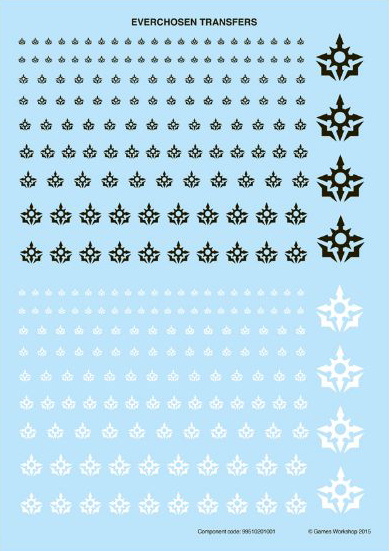 The top one is the Swords of Chaos, Archaon's old personal warband. The timeline in the book is the same as all of the other ones, picking out important battles during the faction's history. There are some cool little nuggets of info here where they hint at stuff from the past ages. The artwork in this is spectacular, with some standout pieces for me being the one of Archaon's horde facing off against a bunch of Black Orruks, and one of them facing down Nagash. These all follow the typical style we are used to, not like the super stylized ones at the start of the book. 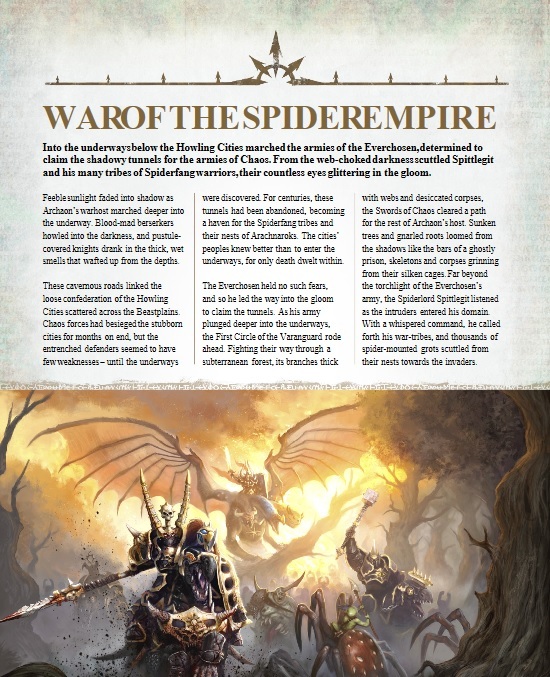 The first battleplan has Archaon taking on some forest goblins and their spiders in the under warrens of an empire of Ghur. It's kind of an uneven fight, obviously, but still interesting, plus we get to see goblins make their first appearance in AoS. The story has the Everchosen and his army fight their way through the tunnels leading to the spider's main nest before taking it out so they can attack the empire from below. 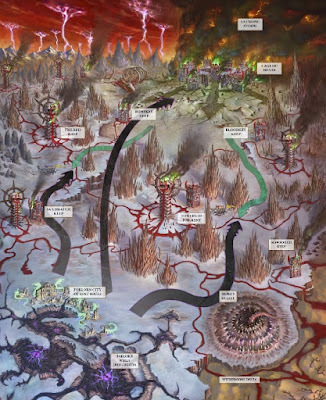 The battleplan has multiple tunnels entrances surrounding the main battlefield and it's up to the Chaos player to figure out which one leads to the main lair. The goblin player can bring on some reinforcements from the tunnel that is the real on, but then the Chaos player knows for sure which one it is, so theirs an element of strategy their on the goblin player's behalf. Is it worth giving the Chaos player an advantage? They can attack the spider nest lair if they are within 3" of the tunnel. After five rounds the game ends and the Chaos player adds up the number of wounds caused to the lair and if it totals more then a random roll of 2D6 they win. It seems fun but I would be disappointed if I lost due to a random roll at the end. I guess you just have to make sure you get over 12 wounds on the lair. The second battleplan has Nagash facing off against Archaon's horde as he attempts to reclaim his army from the Cage of Bones, a fortress made out of his skeletal warriors. 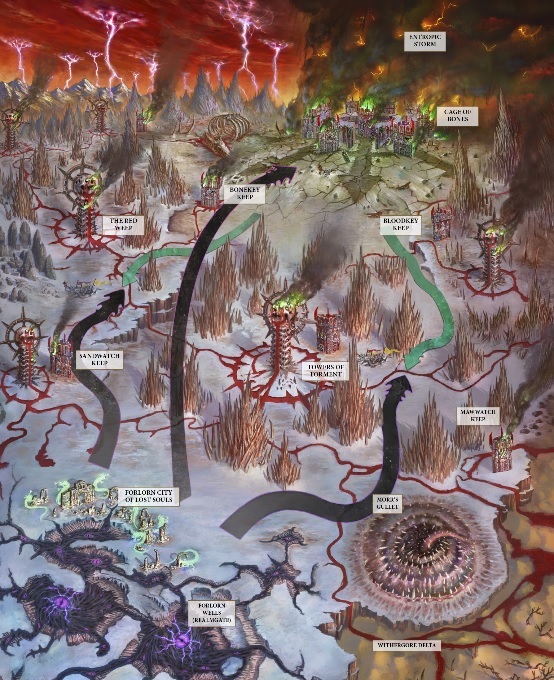 The coolest thing about this battleplan is that it is all about Archaon and Nagash facing off in single combat. While there is a whole battle going on around them, they are what really matters. Instead of using the normal combat rules there is a special table you consult each turn. Each of you picks and action, such as all out attack, use magic, etc, then compare what both of you picked on the table to see what you can actually do. It's a little mini-game within the larger battle, and from what I've seen on twitter, it works just as well with any big monstrous combatants. This one gets points from me for just being super creative. The last battleplan involves a Gaunt Summoner facing off against a Slann and his Seraphon army. The Chaos forces are trying to open a long dormant portal in Chamon that leads directly back to the Realm of Chaos. Sensing what's about to happen the Slann and his buddies teleport down to stop it. The map illustration on this one is pretty cool in my opinion. The actual battleplan has a mechanic for the two opposing wizards to duel involving you holding one set of dice in your left hand and one in your right, you can divide them as you see fit. The left hand is for your magical duel, with the winner inflicting mortal wounds on the other. The right hand is for trying to open the portal. Once the Chaos player opens the portal they win. It's an interesting concept and could be fun. Again, it's nice to see GW thinking so outside of the box on these scenarios. These are all definitely more narrative driven, and I love it. After the battleplan's we get the three warscrolls for the units as well as six battalion formations. 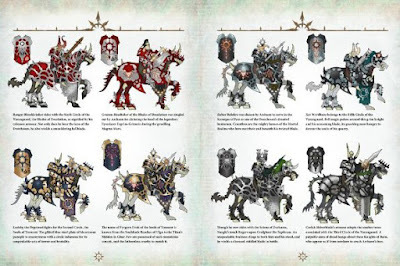 One is just all the units from the new book, which provides a cool way to show Archaon's inner circle, and while not cheap, would be fairly easy to collect. The next four focus warbands centered around a specific god. Each requires a hero and then a number of any other units with that god's keyword. The gods' sacred numbers are used here a lot, both in unit size and number of units. It's nice to see them focusing on that aspect of Chaos again. I have always tried to make my marked units reflect the sacred numbers. My Death Guard in 40k for example are all in multiples of seven, Nurgle's number. The last battalion is the super battalion which combines all of the other one in the book into one giant horde. The battletome wraps up with the four pages of main rules, and that's that. Overall I really liked it. It's super slick and well presented, with some of the coolest story presentation I have seen from GW with the intro part. 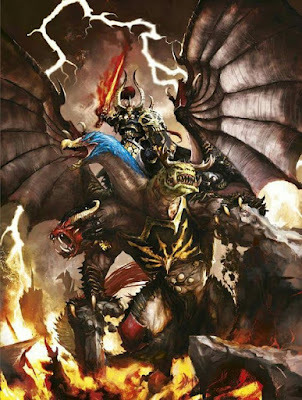 It does a good job of building up Archaon into the big bad that he is and creates a very ominous tone for stories to come. The only downside is how limited it is in story due to only having three units. What stories it can present though are all very interesting and kept me hooked throughout. I don't know if I'll ever collect an Everchosen army, but who knows, I may add Archaon at some point. In my opinion the price should have been lower at $49 to bring it to the same level as the Seraphon and Fyreslayer one since it has roughly the same page count. It's not a huge price jump though, and for the extra $10 you get a dustcover and the transfers, which are nice additions for collectors like myself. If you don't want all of the story and art though, these rules are included in the Grand Alliance Battletome along with everything else Chaos for the super low price of $33. 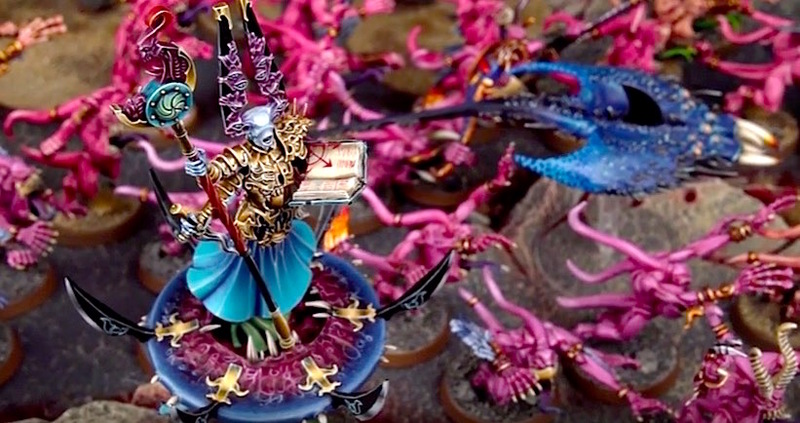 Age of Sigmar really does offer a price point for people of every level of the hobby ranging from free with the App to premium with the Collectors Editions. Presented very well with some truly innovative storytelling techniques by GW, but could have used a few more units to bulk it out. If you like Chaos though you'll probably want to pick it up or if you are just invested in the unfolding storyline like myself.